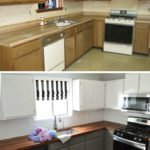 The kitchen may be considered the heart of the home, but in my case, it’s also at the heart of this DIY renovation. When I moved in, EVERYthing needed to be cleaned, upgraded, and replaced in some way. This kitchen renovation has been years in the making. Nearly everything I did in this room was done for the first time, with no prior experience. But sometimes all it takes is a little imagination, discovering some nifty new tools, and some elbow grease. And sometimes, it also involves throwing tools or crying on the floor in frustration. But I got up and kept going, because that’s what’s important. I started by taking out the old appliances and replacing with new. The microwave was then installed over the range, and the cabinets were moved up to accommodate the size I needed and add exhaust. 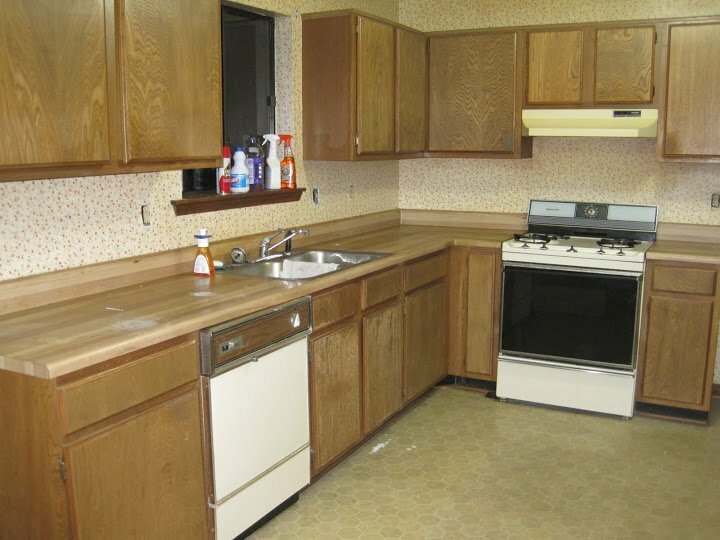 Later, the cabinets were painted in a two-tone style (white uppers, gray lowers), the floor replaced with laminate, and the trim painted white. 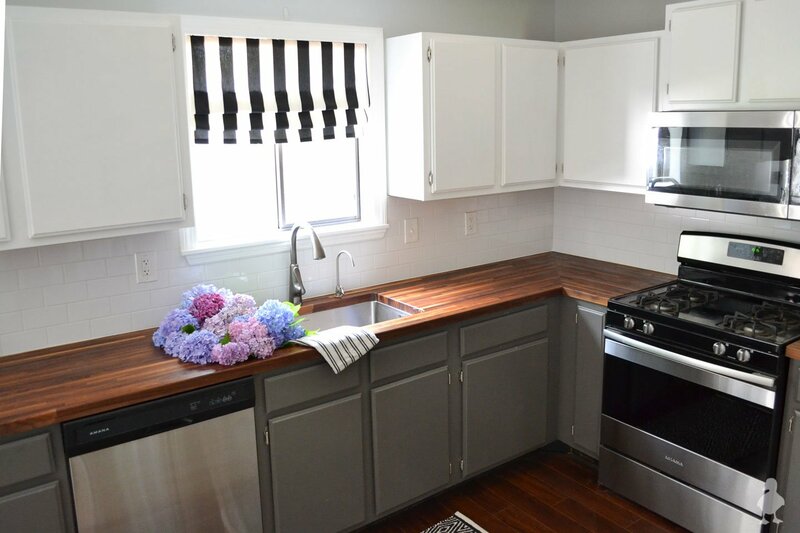 The countertop was replaced with walnut butcher block, while the sink, window, and faucet got an upgrade as well. 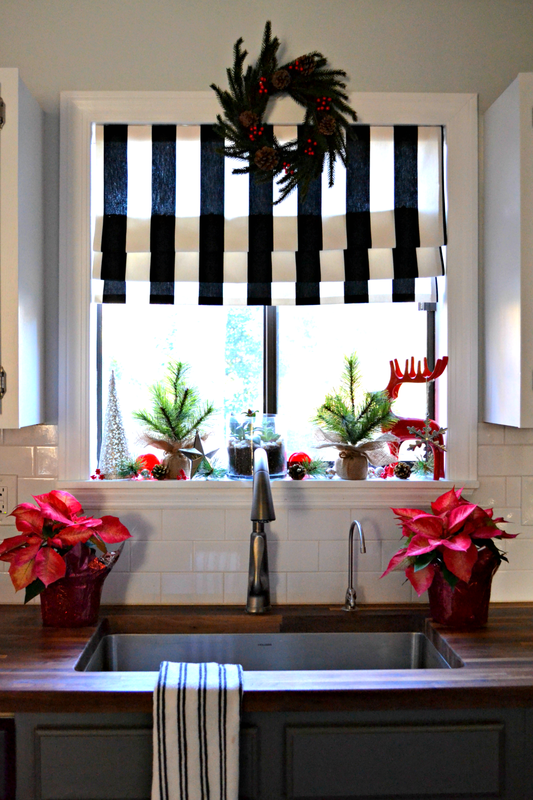 I also added a tile backsplash and a DIY striped faux Roman shade to the mix, and things are looking much cleaner, happier, and updated. While there is still more yet to do, such as adding cabinet pulls, crown molding, and more, this room has come a very long way… enough to decorate this Christmas! For even more kitchen projects, click here. Nice job! Getting ready to do kitchen cabinets alone. 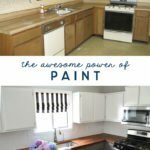 I repainted my den bar cabinets but they were white to begin with. I used BM Mascarpone and thinking of using the same paint for my kitchen. Although I was lazy in the den and didn’t bother taking cabinet doors off, just repainted them on since color was so close. What brand and color did you use? They really make your kitchen bright and modern. Also, any recommendations on paint brushes/rollers? I highly recommend foam rollers for an even finish rather than paint brushes or the kind of rollers you’d use for a wall. I covered lots of the paint details in this post. Hope that helps! I love that you got rid of the flower wallpaper and replaced it with an awesome backsplash. Did you stain the counters too? And are you going to paint the top cabinets gray, like the bottom ones? Awesome work, regardless of what you choose to do with your kitchen. I wish I was that handy, but I can cook! It’s a trade off right? Thanks. No, the uppers were painted white and the bottom are gray (here’s the color breakdown). The counters are actually natural dark walnut, no stain (here’s some more info about that). And yes, cooking is definitely a good talent to have! I have been doing some research on painting my countertops ,I love what you had recommended when you painted yours grey.My question being how strong are the fumes as I am highly sensitive to scents,yes even scents that smell nice.I am a one woman band (and don’t play a single instrument LOL).. and decorating on a dime . I’m wonderiing if you found this to be as easy as it looks,it looked great BTW!! .I also love your brandnew kitchen.Keep posting love your ideas and walk through steps. Short answer: THIS STUFF STINKS. If you’re as sensitive to odors as you say, you need to either get someone to do this for you and take a vacation until the fumes clear out, or wear a chemical respirator until they’re gone. The epoxy fumes really are no joke! harmonious colors. look very modern kitchen. How long does it take you to complete? Thank you! Little by little, this kitchen has taken several years to complete. I love your finished kitchen!!!! I just wanted to say that, if you had not commented on your “mismatched appliances”, I would never have noticed. The black and stainless look very fitting with the color scheme. When I first looked at my home, the previous owners were still living here. 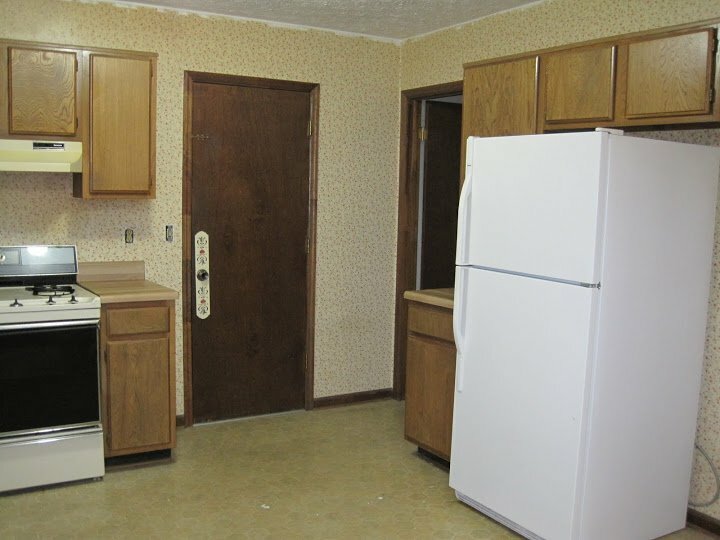 They told me that the kitchen appliances would be included, which was great because all the appliances were black. My own microwave was stainless and black, which was fine. So, we met at the local notary’s office, signed the paperwork, and exchanged keys. They asked for a week to finish moving out and I was more than happy to accommodate them. On moving day, my Mom suggested that I stay behind at my old place and she would go to the new place. This way, we could keep my movers (my dear brothers) from getting too careless. While I was getting another load ready to go, my Mom called and said, “Didn’t you tell me the appliances were all black?”. Long story, well, not AS long. They had taken the nice, fairly new, black fridge out and left an antiquated, almond-colored monstrosity in its place. So, for the first two years here, I had an almond fridge, black range, and stainless microwave. So, yours looks pretty perfect to me! Thank you! And arg, I’ve heard stories like yours before! The fridge is usually the thing that people find have been replaced or moved. The previous owner of my house had a brand new fridge and also took it with her. I was already prepared to spend the money though, so no surprises when it wasn’t there! Glad you eventually got your upgrade, even if it took a bit longer than you expected! where are the pic of the other side of the Kitchen??? Beautiful kitchen, thanks for the tour. Your wood countertops are a perfect fit! I like that counter tops. This is looking really beautiful specially the holiday section. I also want to remodel my kitchen. Oh, this is so nice! 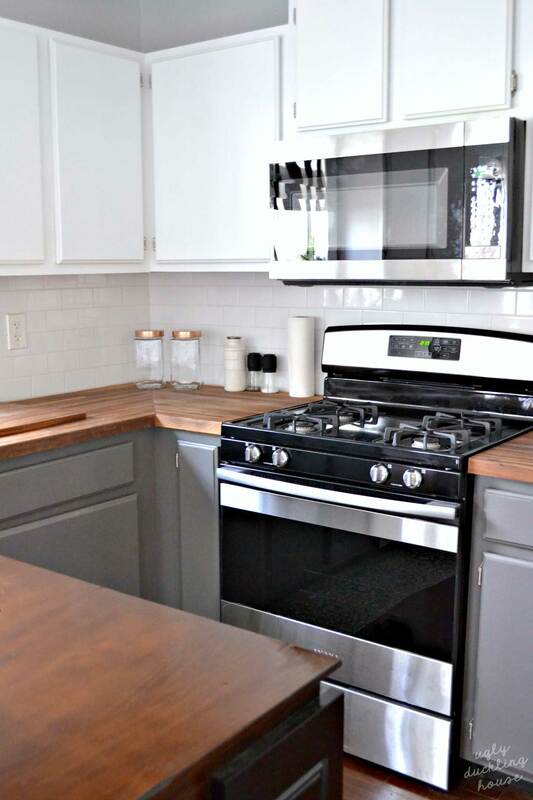 I like the color of the flooring and the butcher block, and everything! I’ve got a really dated kitchen. the house was built in 2000. I’m ready to get rid of the grayish carpet and put down a pretty flooring like this. Is it laminate or hardwood? Laminate! Had them for six-ish years now, and I still love them! I was wondering, where did you get your curtain? It’s really cute! I made it! The post is here. 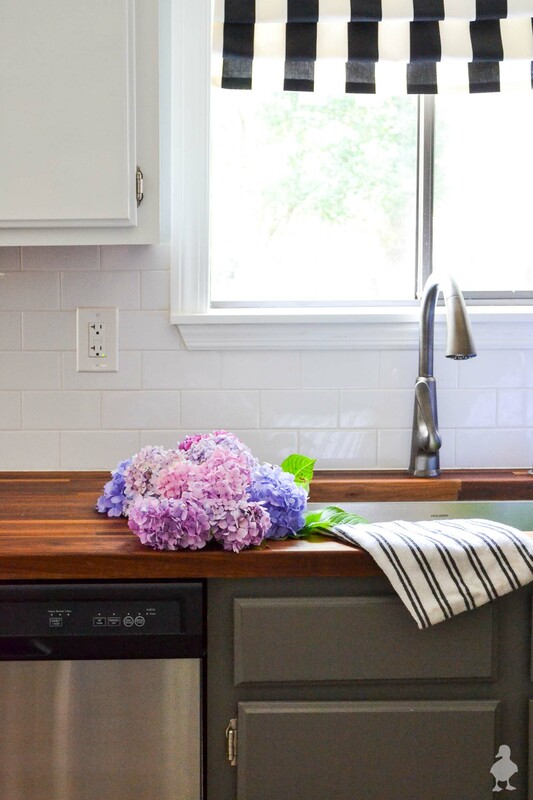 Love the darker color of the butcher block counter tops. Have only seen lighter colors in our area. I would not have thought to use grey for the cabinets but it looks amazing. Is the conditioner you have in the article what you used to achieve the color? The color is the natural hue of the wood after it’s been conditioned. Walnut is a rich, dark wood. There are 100s and 1000s of ideas to do the kitchen makeover. I don’t like to add too much to my kitchen. I prefer to keep my platform of the kitchen as less occupied as I can. In kitchen makeover I would like to add some portable tings that uses less space and which satisfies all my kitchen needs.